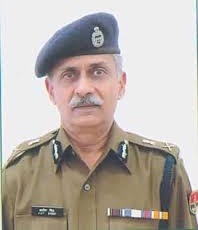 Ajit Singh Shekhawat, a 1982 batch Indian Police Service(IPS) officer was on 31st July appointed as the new director general of police(DGP) by the Rajasthan government. Singh replaced outgoing Manoj Bhatt who retired from the service on Monday. Ajit Singh was holding the position of DG prison, additional DGP Sunil Kumar Mehrotra has now been given the additional charge of state prison department. Ajit Singh was instrumental in leading talks with Rajput leaders during the crucial hours of Anandpal Singh encounter agitation which unfolded in Nagaur last month and took violent turn. Himself from Rajput community, Singh was sent to violence hit Sawarda village of Nagaur as the government's emissary to find a common ground with protesters. Singh hails from Jaipur and completed his school education in the city, and graduated from St. Stephen's college in New Delhi. He carved a niche from himself as 'efficient cop,' with clean image who resisted undue influences in policing.